Seemorerocks: A strong el-Nino by the southern Summer? A strong el-Nino by the southern Summer? 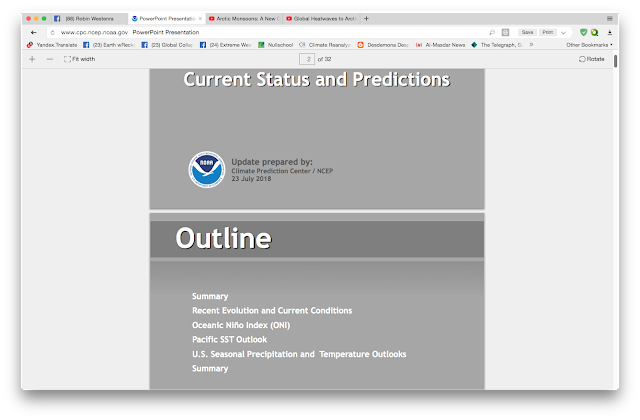 NOAA have put out their report on the el-Nino today. The El Niño–Southern Oscillation (ENSO) remains neutral. However, the Bureau's ENSO Outlook is at El Niño WATCH, which means the likelihood of El Niño forming in 2018 is approximately 50%; double the normal chance. Oceanic ENSO indicators remain neutral, but show a general trend towards El Niño. Sea surface temperatures in the equatorial Pacific are about 0.5 degrees warmer than average. Likewise, sub-surface waters in the eastern tropical Pacific are warmer than average, although these have eased slightly in the past fortnight. Atmospheric indicators remain neutral, but the 30-day Southern Oscillation Index has been negative since the middle of June. Most international climate models surveyed by the Bureau suggest the tropical Pacific will continue to warm. Five of eight models indicate this warming will reach El Niño levels in the southern hemisphere spring, while a sixth model reaches El Niño levels in December. During El Niño, rainfall in eastern Australian is typically below average during winter–spring and daytime temperatures are also typically warmer than average for southern Australia. A neutral ENSO phase has little effect on Australian climate. The Indian Ocean Dipole (IOD) remains neutral. Three of six climate models suggest a positive IOD event may develop, with a fourth model close to meeting thresholds. A positive IOD event typically reduces winter–spring rainfall in central and southern Australia, and can exacerbate any El Niño driven rainfall deficiencies. Latest El Nino Predictions still continue to show a Moderate to Strong event by Winter 2018-19. Trade winds are expected to slacken by the middle of this week with further weakening possible by Early next week. Weakening of the trade winds allows the warm pool of water in the western pacific to slosh it's way eastward, El Nino is born. So Far the Low level trade winds have not quite matched up with the surface winds. Even if there's some weakening of the trades, Low level trades at 2,500 feet also have to fully weaken or reverse for a extended period of negative SOI Values. More Details are in the video.